Here is the scheme of legal collapse of Ukraine. It tells a story how we are trying to make the government of Ukraine to implement the Constitution, especially when it comes to personal voting of Members of Parliament. On April 17th Member of Ukraine’s Parliament Mykola Lisin (Party of Regions) wrapped his Lamborghini Gallardo around a post after executing several barrel rolls at 240kph – with predictably fatal results . His funeral was on April 19. In the morning of April 20 he was shown as actually SIGNED IN PERSONALLY by ledger on the Parliamentary website. Screenshot below. To the phantom’s credit, his voting card did not vote that day. On April 7 2011 Ukrainian Parliament voted on new law on prevention and counteraction of corruption. The voting occurred in a half empty parliament. The absence of a large percentage of MPs was glaringly evident on live TV broadcasts from Parliament. Since April 6 the official website of Ukrainian Parliament lists ledger results of MPs written registration they sign before each day the meetings are held. This site also publishes the results of electronic registration of MPs (by inserting keycards into readers) and the results of their votes cast with the these cards. These lists – the ledger and the electronic registration – do mismatch seriously. 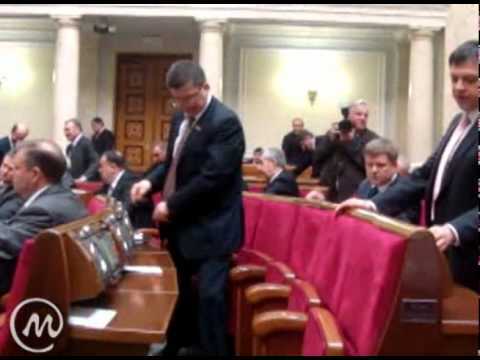 Scandalous fraud in Ukrainian Parliament, PROVEN!